So, I'm sure you realize that food is mostly incredible in Morocco. But food marketed to travelers is often a lot more than Moroccans pay to eat. For example, last time we stayed at Ryad Alya in Fes, we had a wonderful dinner in the salon. It was multi-course and memorable, and served in a romantic setting. It was around $30 each. Very cheap for an incredible meal in the US, but very pricey here. So we often ask cabdrivers and women shopkeepers for recommendations. Of course, it helps to speak French or Moroccan to communicate with them, but you could probably get by with "tagine zween?" which means beautiful / delicious tagine. We also look for restaurants where women or families are eating, which is a good sign because many Moroccan women don't eat out often but prefer to cook at home. Lots of Americans seem to have stomach problems here, and I came prepared with all sorts of meds for it, but so far (knock on wood!) I've been fine. I do drink only bottled water, and feel a bit badly about it since they don't really recycle here, but you have to do what you have to do. Our lunch (half-eaten, sorry, forgot to snap a photo at the start! 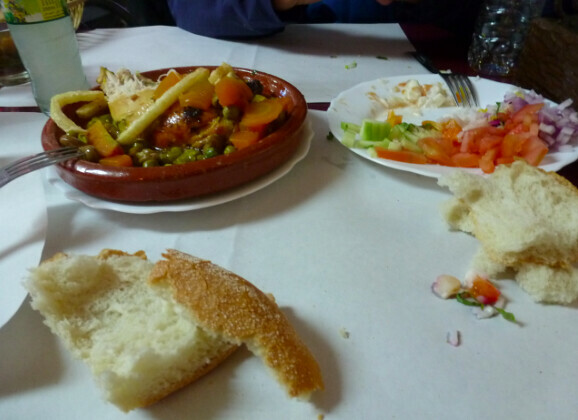 ), which was a chicken tagine with local peas and fava beans and french fries on top. We also had a Moroccan salad which had carrots, beets, and so on. Virtually all meals here are served with bread, since Moroccans eat with their hands, so it's a good way to bulk up a salad. This was about $4...see what I mean? 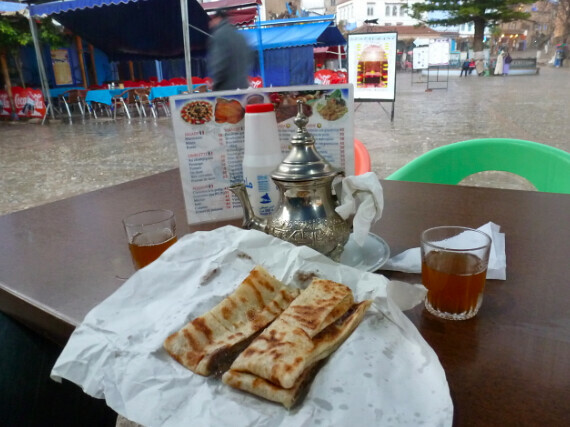 We also try to make the most of cheap foods like msimmon (that is my made up phonetic spelling), Moroccan crepes, often served with mint tea and honey. Our crepes and tea were only about $2. It's still fun to splurge sometimes - but since we're here for six weeks, we've got to be careful. Lucky for us, we're still eating very well!